Black cat Elvis is a looker. 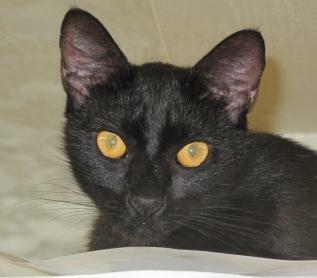 As if those orange eyes weren’t inviting enough, Elvis has a glowing personality to match. He gets along well with other animals, but is just fine on his own as well. This shorthaired beauty is happy to snuggle but doesn’t demand constant attention — a dream cat with gorgeous looks. He’s also neutered and up to date on his shots. Elvis is available for adoption throughthe Gonzales Animal Shelter in Texas.